DENVER -- A $5 million Country Club mansion turned short-term rental will no longer be allowed to host guests after its license was removed by the city of Denver. The action taken by the Department of Excise and License marks the first time the city has revoked a short-term rental license. Neighbors described wild parties at the home and people jumping off the balcony into the pool. "It looked like a fraternity party. There were probably 20 or 25 people and they were enjoying the backyard, it’s wonderful. There’s a hot tub and swimming pool and they were having a wonderful time," said Judy Plock when she talked with Contact7 back in January. In November, the Department of Excise and Licenses ordered the property’s owner, Garth Yettick, to show cause that the Marion Manor has his primary residence – a requirement for Denver’s short-term rental licenses. Neighbors said they had not seen Yettick much at the home during 2018 but that they had on numerous occasions seen large groups of people staying there for days at a time. A first-of-its-kind hearing was held on the show-cause order on Jan. 17, and on Jan. 23 – the day Denver7 published its story on Marion Manor – the hearing officer recommended that Yettick’s short-term rental license for the property be revoked. In the final decision letter , which was obtained by Denver7, the city wrote that the Department of Excise and Licenses had not received any objections to that recommended decision from either Yettick or the assistant city attorney. In the findings and conclusions of the final decision against the rental license, the Department of Excise and Licenses wrote that despite Yettick arguing the Marion Street property was his primary residence, him presenting four witnesses who testified as such, and his presenting two documents showing the property was his primary residence, that 410 N. Marion Street was indeed not his primary residence. “[Yettick] advertises 410 N. Marion Street as a ‘hotel’ which sleeps twenty and offers concierge service,” the decision letter states. Property records reviewed by Denver7 and the department also showed that Yettick had bought another property, a condo, at 105 Fillmore Street in August 2017 and that he was living there with his partner, whom he was “inseparable” from, the final decision letter says. 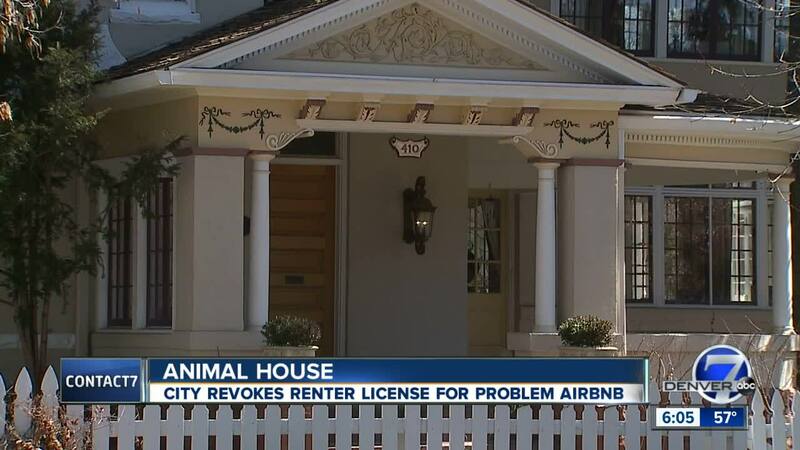 The final decision to revoke Yettick’s short-term rental license for the Marion Street property, though the first revocation of such a license in city history, is subject to review in Denver District Court should Yettick decide to petition. “Denver is determined to have a regulated short-term rental market that is business friendly, but also protects the integrity and safety of our neighborhoods. Today’s enforcement action to remove the license of an illegally operating short-term rental reinforces the fact that we are determined to enforce primary residence rules,” Denver Department Excise and Licenses Executive Director Ashley Kilroy said in a statement to Denver7. “Denver welcomes short-term rentals that operate within the rules to protect the community, but we will not hesitate to take action following legitimate complaints from the community. Good government begins and ends with our community having their voices heard and their complaints addressed, and that’s exactly what we are doing here,” Kilroy added. Denver7 has been unable to reach Yettick since our initial reporting on the property and license in January. The home is now for sale and for rent, according to the home’s website . A rental listing showed it was available Feb. 1 at $11,500 per month. There are currently 2,573 active short-term rental licenses in Denver, and the city says it saw compliance rates with licenses hit an all-time high of 72 percent this month. The city rolled out new rules for short-term rental licenses earlier this year, which will go into effect on April 10. The new rules include new insurance requirements, clarifications on compliance and other changes.